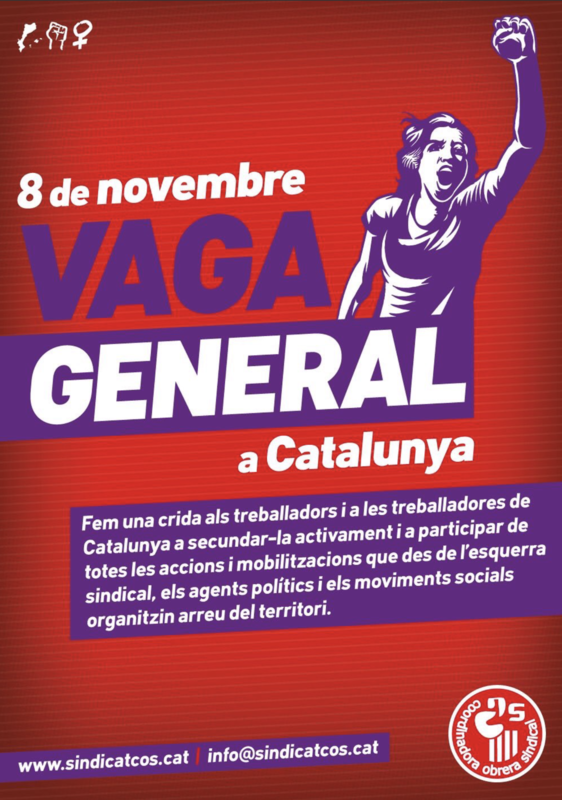 A general strike is planned for Wednesday 8 November in Catalunya following the imprisonment of several ex-ministers of the Catalan government and two leaders of pro-independence organisations. The Assemblea Nacional Catalana, whose chairman Jordi Sanchez is currently in prison, is calling for a national ’stoppage’ (‘aturada’) on Wednesday 8 November. 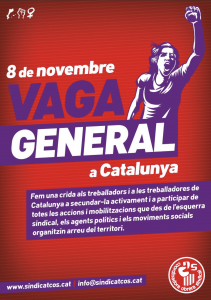 Catalunya’s fifth-largest union, Intersindical-CSC, is planning a general strike for 8 November. The union represents Catalan workers and covers most industries. The aim of the strike, according to its website, is to fight for workers’ rights following recent changes in labour laws. The union also demands the repeal of the law introduced on 6 October which allowed companies to more easily relocate their headquarters out of Catalunya. Several other bodies, however, such as the Taula per la Democracia confederation, which spearheaded the 3 October strike have not yet pledged any action for 8 November. Other protests are taking place throughout the rest of this week. Media reports on Monday said that trains had been stopped and roads leading out of Catalunya had been blocked by protesters. Every evening towns across Catalunya are holding ‘cassolades’ (pots and pans protests). A demonstration is planned in Barcelona on Saturday 11 November.